Exactly one year ago: Welcome to Alaska! Exactly one year ago today we arrived in Skagway, Alaska on the 31st day of our journey from Georgia! We had a wonderful time as we traveled across the U.S. and through Alberta, British Columbia and Yukon but after 31 days we were ready to see Alaska. Here is my original post from Skagway after we finally arrived. Day 31: Saturday, June 15, 2013. Watson Lake, Yukon to Skagway, Alaska. Pullen Creek RV Park Site 45 overlooking the Skagway Harbor and surrounded by mountains. 320 miles traveled. I was talking to a fellow traveler at the RV park in Watson Lake before we left there this morning and I commented that this was our 31st day on the road and we still weren’t in Alaska! Our plan for the day was to continue on the Alaska Highway to Whitehorse, Yukon and enter Alaska northwest of there in several days. It was another beautiful drive on the Alaska Highway with some nice places to stop along the way. We stopped for lunch at a rest stop. While I was fixing lunch Henry walked over to read an interpretive sign. On the sign was a large map of the area. As we were eating he commented that we weren’t very far from Skagway. We talked about it for a few minutes and he was just as anxious to get to Alaska as I was. We had to make a decision as the turnoff to go to Skagway was in about six miles. I entered Skagway into the GPS and it was 59 miles to Whitehorse and about 102 miles to Skagway. It was a no brainer. We were going to Skagway. We left the Alaska Highway and off we went. We were about halfway to Skagway when I realized it was Saturday of Father’s Day weekend. What if all the rv parks were full? There was no cell service and no way to find out until we got there. I read ahead in the Milepost and saw in red letters warning of an 11 mile descent with 11% grade going into Skagway. I told Henry “There’s something coming up you’re not going to like.” There was no turning back. The drive on the Klondike Highway was spectacular. Snow covered mountains, deep blue ice covered lakes. There were even two bears along the highway. We couldn’t stop to look at anything. I kept checking my phone for cell service. We had to get AT&T when we got to Skagway, didn’t we? 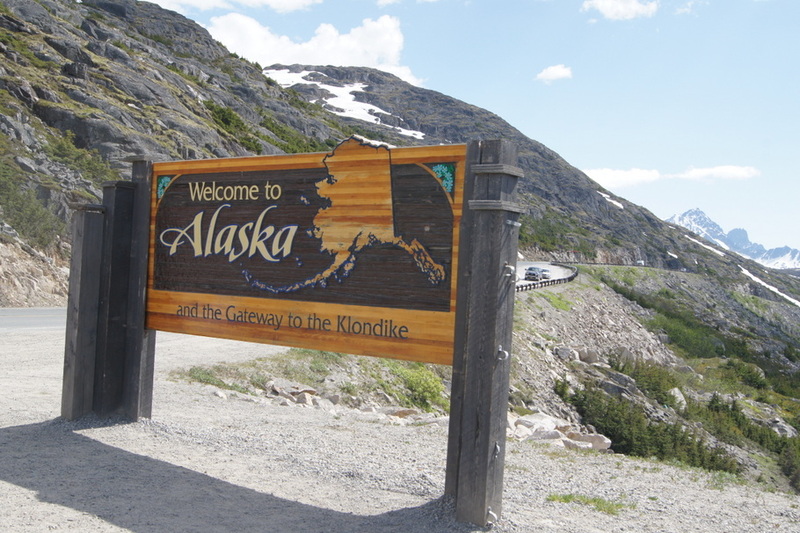 Finally, we stopped for pictures at the Welcome to Alaska sign! We were really here! We cleared customs with no problem and headed straight for the Pullen Creek RV Park hoping for one of the waterfront sites on the harbor. We asked for 2 nights, maybe 3. He said no problem, go pick one and come back and tell me where you are. After setting up, we were happy to just sit outside and enjoy the view. Henry says I looked like I was going to cry when I saw AT&T with full bars and 3G come up on my phone. We called our kids and enjoyed the rest of the night. My best advice is to give yourself plenty of time! You will love it. Thank you for wanting to use our blog to help with your Alaska trip next year! Looking forward to following you on your Alaska adventure! I can’t believe it’s been a whole year! How about next year? Would love to meet up with you’all at the West Coast TI rally in Pahrump, NV @ a luxury resort April 9-13. Resort was built for $$$motorhome owners to buy a lot. Economy tanked, so open reservations @ $25/night. Ingrid, just go! You will love it. As an Alaskan, I’m biased, but there really is no other place quite like it. I agree with your advice to give yourself plenty of time. It’s not a difficult trip anymore, but you have to cover a lot of miles just to get there and it’s nice to give yourself some flexibility to work around bad weather. I’m really glad you enjoyed it so much. Ingrid, you should go for it! . Yes, there is no other place like Alaska. I wish we could return every year! We’re planning to go to Alaska in 2016, and your travels and experiences will be a wonderful resource for us. We’re not used to driving long distances in one day — we prefer less than 200 miles — but I suppose we’ll have to bite the bullet for some longer driving days for that trip. Laurel, we usually don’t like to go over 300 miles a day and 200 is even better. We prefer to stop around 3 or 4 pm but we did push ourselves when traveling across the U.S. and in parts of Canada. Once we started seeing wildlife and beautiful scenery we took it pretty slow. One day we only drove about 6 miles from one campground to the next. You will love the trip! Sounds like a great trip. An 11% Grade…. oh ummmmmm. The 11% grade wasn’t as bad as it sounds. The scenery was spectacular and getting to Skagway at the bottom was well worth it. ALASKA!! I want to go!! Beautiful photos! And you got to call the kids! Priceless! Just do it! You will never regret it.